Right from day one, make clear rules and post them, with logical consequences and with rewards. Move his desk to where there are fewer distractions. Close to the teacher to monitor and encourage, or near a well‑focused child. Privacy boards can work well, but should never embarrass the child. Students with attentional problems do better in classrooms with four walls than in an “open pod” arrangement. Open pods allow too many visual and auditory distracters throughout the day. It is usually better to use of rows for seating arrangement and try to avoid tables with groups of students. Often the groups are too distracting for the ADHD child. In the ideal setting, provide tables for specific group projects, and traditional rows for independent work. Of course, we are rarely in an ideal setting. Your student’s desk should be near the teacher (for prompting and redirection), away from other challenging students, and not touching others’ desks. However, if you notice that your student looks around a lot to see where noises are coming from, because he is very distractible via auditory channels, he may benefit from being seated near the rear of the classroom. Experiment with seat location in the front of the classroom (near the board) and instructional area if your student is more visually distracted. 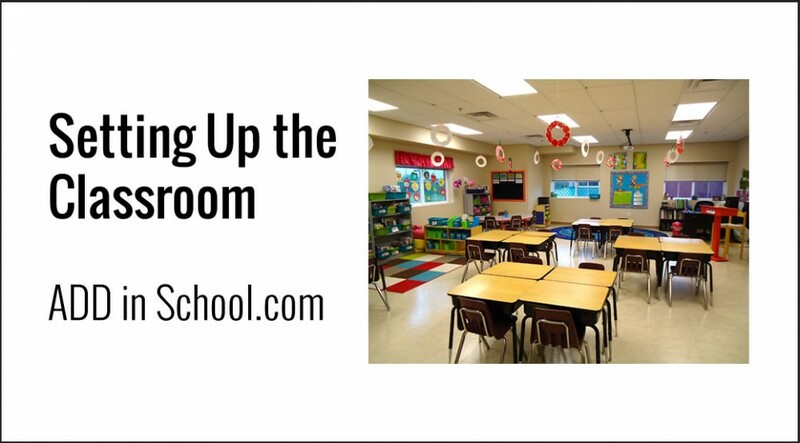 It is important for the teacher to be able to move about the entire room and to have access to all students. Practice Management By Walking Around in the classroom. The more personal interaction, the better. Have all of the distractible students seated nearest to place in the class where you will give directions or lectures. At least as close as possible without being punitive. To minimize distractions, seat the student away from both the hallway and windows. Use desk dividers and/or study carrels carefully. Make sure they are used as a study area option rather than as a punishment. Your student will function better when able to anticipate times requiring increased concentration. A visual representation of the day’s schedule will provide another opportunity to internalize classroom routine. Keep a portion of the room free of obvious visual and auditory distractions. Have at least a part of the room free from bright, loud, or distracting objects. Your student tends to lose focus and his activity‑level may increase during the day. Therefore, schedule the most demanding attentional tasks in the morning. In our desire to provide an engaging classroom for students, try to be aware of the auditory and visual distractions present. Attempt to place your student where these would have the least effect. Seat those really smart and quiet girls next to the ADHD child. Stand near the student when giving directions or presenting the lesson. Use the student’s worksheet as an example. Every once in a while, try arranging desks in a horseshoe shape to allow for appropriate discussion while permitting independent work. We know that teachers are neither God to control the weather, nor the janitors to control the thermostats. But as best as you can, provide comfortable lighting and room temperature. Use individual headphones to play white noise or soft music to block out other auditory distractions. Be sure the music is not too interesting so that it becomes a distraction. It has become somewhat fashionable to play classical music, or baroque music, quietly in the background while students are working. This may, in fact, actually work. Provide a quiet, carpeted space in the room as a special study section for independent reading. Many students often bring their own distractions (toys) from home. Try to make a classroom rule about appropriate time/place to share them with classmates and limit their appearance in the classroom and on the desks. Establishing certain categories for classroom sharing on certain days can limit the number and type of items brought to school and make it more successful for the students.